ORLANDO, Fla. – April 24, 2018 – ProfitSword, a leading developer of business intelligence and data integration software for the hotel industry, announces the addition of 126 properties from six hotel management companies to its current roster of hospitality customers during the first quarter of 2018. These numbers represent a 74 percent increase in growth rate over the prior year’s sales pace, positioning ProfitSword as a leading provider in hospitality data management, as it continues to experience strong company growth in the hotel sector. Providing the hospitality industry with a comprehensive suite of software applications dedicated to efficient and effective data management and integration, ProfitSword’s platform consists of ProfitSage, ProfitWizard, ProfitPace and ProfitPlan. These cost-effective tools are specifically designed to help business professionals better manage their data for faster and more well-informed decision making, as well as detailed reporting. A solution developed to effectively manage sales data, ProfitPace allows businesses to efficiently monitor sales team efforts to ensure that the company is on track to achieve individual and company sales goals. It also allows for the comparison of sales pace to forecast, budget, prior years and same time last year trends. ProfitSage provides hoteliers with a user-friendly tool that integrates with standard business operation platforms for data collection and management. Using ProfitPlan, hoteliers can incorporate stylized report templates to produce several types of reports required to manage daily tasks and information. 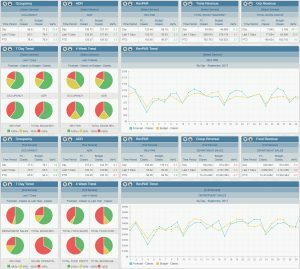 ProfitSword’s data analysis tool, ProfitWizard, combines business intelligence, decision support, performance management and ad-hoc reporting for efficient analysis of data.